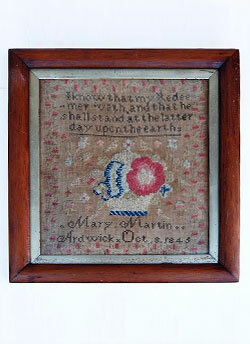 Circa 1830-1850: Wonderful signed reticule, Mary Smith. 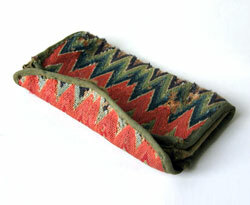 Bottom adorned with tree motif, and bold stripes of black, greens, browns and creams make this little early antique purse charming. 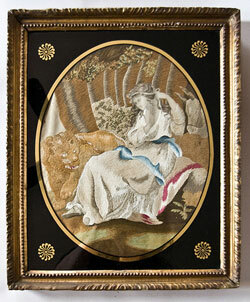 Signed "Eliza H. Booth Mich. 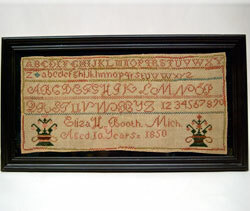 Aged 10 Years 1850": Michigan samplers are rare, and even advanced collectors can go a lifetime without holding one in their hands. 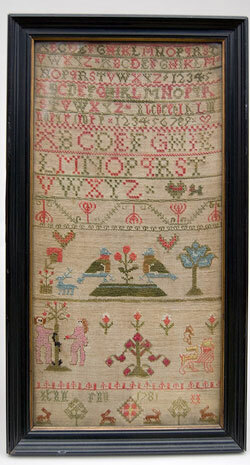 This scarce antique Midwestern textile measures 18 1/2" wide and 8 1/2" tall and is housed in a 22" X 12" frame. Circa 1816: Ann Gill Withington was born January 11, 1805 in Dorchester, Suffolk County, Massachusetts, to Mather and Sarah Withington. 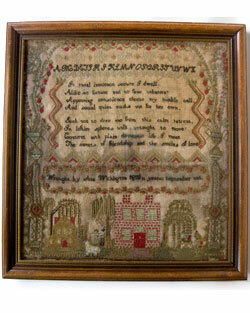 Miss Withington's paternal grandfather Ebenezer Withington (1729 - 1800) was involved in the Boston Tea Party. 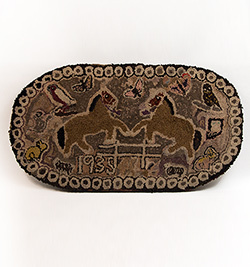 Circa 1850-1875: 19th century small beaded purse with folk art scene, large graphic florals and charming decorative top border. 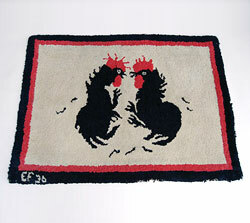 Circa 1781: Striking motifs, black snake, naked adam and eve, rabbit border, hearts, birds, flowers and more, along with excellent condition and early date make this a stand out antique sampler. 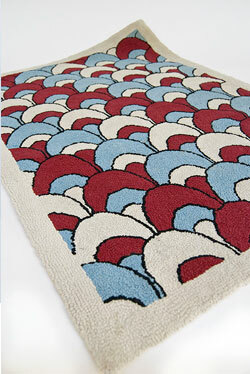 Circa 1920-1940: Wonderful color on this art deco era, clam shell, red white and blue antique americana hooked rug. 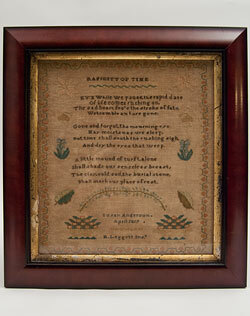 Signed Labitha Jane Hanner: Samplers from the American Antebellum South are scarce, and hairlock samplers from any region of the country are rare; so to find a surviving Southern hairlock sampler in excellent condition is a real treat for the early textile collector. 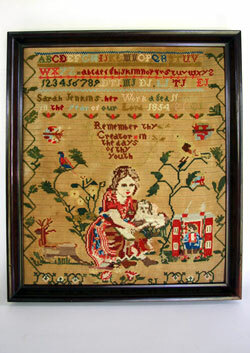 Labitha Jane Hanner's primitive and folksy sampler was completed in August 1843 during the dog days of the rural North Carolina summer. 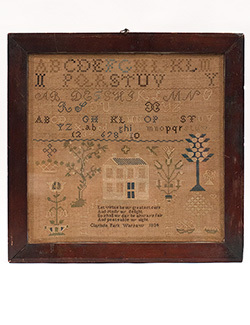 This lovely piece of 19th century schoolgirl needlework contains six alphabets, two rows of numbers, a series of practice initials, young Miss Hanner's signature and completion date, and, most importantly, a humble lock of blonde woven into a circle and accented with a small silk ribbon. 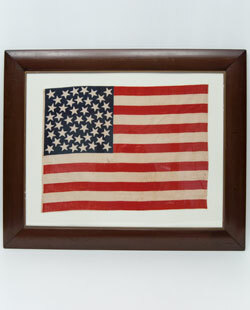 Circa 1896: We just acquired this wonderful and rare medallion pattern1896 American flag. 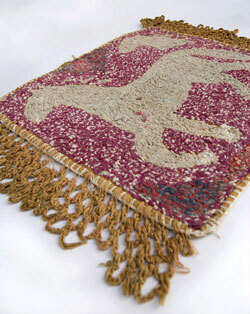 The early printed parade flag is in excellent condition with appropriate aging to the cotton and great brillance in the printed red and dark blue. Circa 1890: The 42 star American flag was never officially used because Idaho gained statehoodjust before the July 4th deadline, making the official United Statesflag of 1890 have a 43 star count. 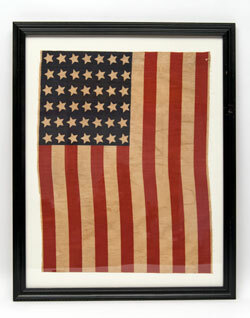 The 42 star flag was made for under nine months and thus is hard to come by, and this lovely parade flag is, in this condition, a rare survivor. 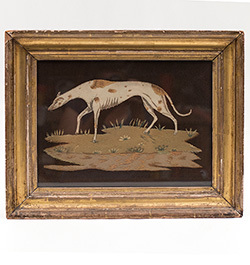 This frame is housed in an unobtrusive modern black frame that keeps the viewer's attention on the graphically pleasing and unusual six by seven star pattern, and we have backed this lovely 19th century American parade flag with acid free board. 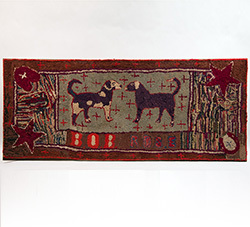 This wonderful flag will enhance any collection of early patriotic Americana, antique textiles, or early American antiques. 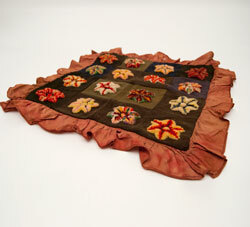 Attributed to the Amish: Wonderful raised six pointed stars and delicate red cotton trim (please note the delicate red border does have some small holes) decorate this early folk-art textile from Pennsylvania attributed to the Amish. 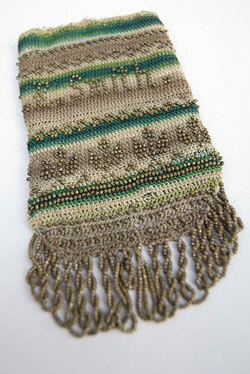 The bright rainbow yarn in this example plays well against the somber wool squares. 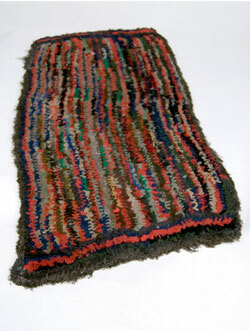 Circa 1780-1800: Vibrant salmon and green colors with bold graphic pattern. 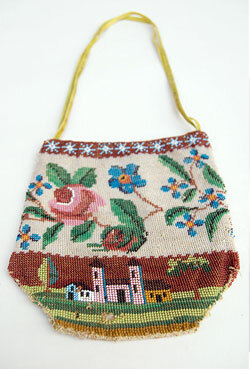 Both men and women carried pocketbooks during the last half of the 18th century. 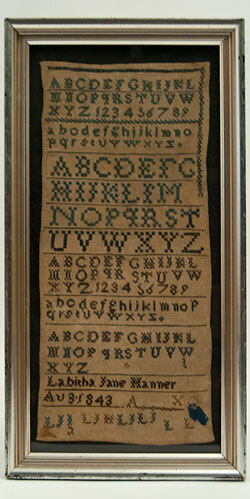 These accessories held currency, jewelry, papers, and other valuables. 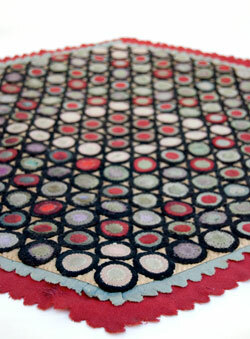 Circa 1900-1925: This rug measures a wonderfully petite 26" by 23 1/2" and is in excellent as found condition with no replacements or repairs. 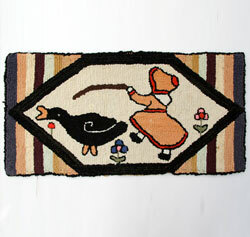 Circa 1920-1940: Great naive expression on this wide eyed folk art cat hooked rug. 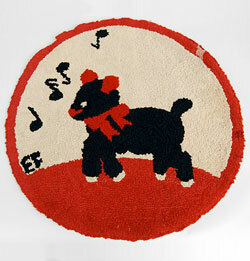 Large bold flowers flank both sides of this Welcome rug. 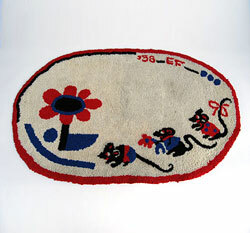 The great large white cats tail curves down and breaks the space in a delighful primitve way. 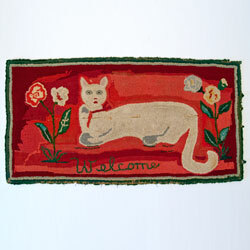 Bold reds contrast with the great white cat and create a stunning visual piece of American folk art.